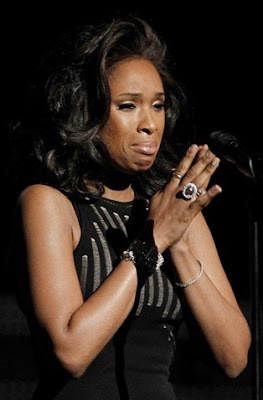 Jennifer Hudson's tribute to Whitney Houston at the 2012 Grammy's Sunday night was very moving. Ms. Hudson's performance was incredible - not only because of her beautiful voice and the personalized lyrical additions towards the end of "I Will Always Love You", but also because of her very human-emotional displays which of course, provoked strong feelings of grief-sadness-empathy in all who witnessed and heard her performance. In the image above, Ms. Hudson shows us an "Inward Lip Roll" (aka ILR) which is a common nonverbal seen when there is an effort to "hold in" strong (usually negative) emotions. She knew Whitney personally, so her sadness-grief was certainly more strongly felt than most other performers would be in her shoes. Her eyelid closure at this same moment shows even more of an attempt on the unconsciousness's part to sequester sadness. In the next image (below), Jennifer adopts a prayer/pseudo-prayer emblem with her hands. Although Ms. Hudson's faith is unknown to me/most of us, depending on the other Body Language it's clustered with, it can indicate several different emotional states. When we look at her facial characteristics - e.g., her slightly upturned inner (medial) eyebrows, chin wrinkling, lateral-mouth tension with a slight down-turning of the mouth's corners - all project solid emotional characteristics of sadness. In addition, in this context, her elbows-in configuration (held close to her sides) gives us an additional signal of low-comfort/sadness. Often when a person is attempting to hold back tears and reign in a sadness, their mid-face will display a vertical and horizontal stretching-tension. This is extremely common. It's easy to spot if you know what to look for - the nasal flaring (dilation) and tightening of the "mustache area" is a neon light for her effort to hold back tears. In this final image (below), Ms. Hudson transitions further to a mouth covering just after the pray/pseudo-prayer emblem noted above. This particular gesture has a very high sincerity quotient. When you see it displayed, especially when clustered with other body language as we see here, there is an extreme amount of empathy being experienced. If it is preceded by, or coexists with surprise and/or fear, it can indicate shock-disbelief.